What a year its been so far. 2010 has held only one constant for me, malady and that is that things are CONSTANTLY CHANGING. 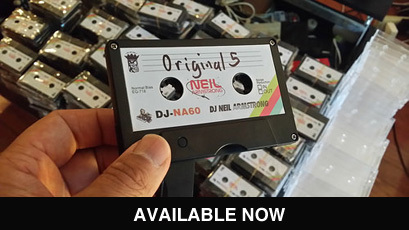 Here we now have for the 1st time, a website for the brand – http://djneilarmstrong.com. I welcome of y’all to the new site, which will be the homebase to get a taste of all my future projects and endeavors. But lets take a quick sec back to about a month ago, when the next chapter of my life started. What has happened in my life over the last two years is nothing short of incredible. 2010 is poised to be a boundary-pushing year for me–new horizons and new creative challenges. Above all: the start of the next chapter. If in January of 2008 you told me that I would travel the world with Jay-Z, perform at the Olympics in Beijing and at President Obama’s Inaugural Ball with the Roc Boys, have bagels on Damien Hirst’s boat, represent the elements of hip-hop alongside Kanye and Coldplay, perform at MSG for the firefighters and police lost in 9/11–and now be featured in a global TV campaign for Adidas and Star Wars (with David Beckham and Snoop Dogg nonetheless)–I would have said, “yeah right.” Didn’t you know: I’m just a turntablist? But that has all happened. Now in 2010 you will see me embark on a new chapter in my life: as a Global Spokesperson for Adidas. I’ve gone from the three red stripes of the Blueprint 3 and onto the three white stripes of Adidas. From the premier face of hip-hop to the kicks that rep it best: my adidas. For Jay’s upcoming tour, my familiar face will not be there behind the 1’s and 2’s. Hov will be “Armstrong-less,” but I’m sure that he and the Roc Boys will be more than alright. And who knows, maybe if my schedule and Mr. Carter’s coincide, and the stars align for the right reasons, you might see me at a stadium near you — once again throwing up that almighty diamond. But for now , my seemingly impossible career, has led me to the brand that coined the term ‘Impossible Is Nothing’. While the Roc Boys and Mr. Carter are poised to travel far and wide in the name of the music I love most, I’ll be on my own award tour repping for Adidas and rocking parties for you the people. And when I’m not on the road, I’ll be back in the lab, back in my creative space making new mixes and an array of other musical treasures. (**I know a lot of y’all new fans know me as Jay-Z’s tour DJ–but previous to that I was known for the “gourmet mixtapes” that I would drop every so often). Download here for free – The DNA of the Blueprint. A tribute mix to thank Mr. Carter for all the amazing opportunities he has given me.